Assembly of Zala county has decided to change its colours from green-golden to blue and silver. Regulation issued on 09 July 2010, but it will be valid from 08 September 2010. By the study made a leader of County Registry, green and yellow colours were not used by Zala county in the past (only in recent times), but blue and silver were more popular. 08 September is Day of Saint Adorian, who is a patron of Zalavar. It celebrated its 1000th anniversary of establishment of settlement, last year. So, pattern of coat of arms and flag will be unchanged, only the colours will change to blue and silver. Only exception is the crown, it remains golden. Ratio: 2:1. Adopted: 1990. Capital: Zalaegerszeg . Always hoisted vertically. The arms are the same as of former (Austrohungaroan) county of Zala (granted 1550), sometimes coloured Azure in place of Vert. You can see a photo of Zala County flag at <www.zalamedia.hu>. The Res. No. 1/1991. (II.2.) 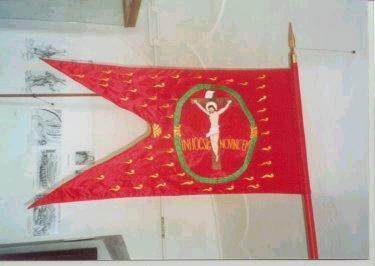 of the G.A of Zala County about the Coat of Arms and the flag (in Hungarian) at <www.zala.hu/kozgy>. 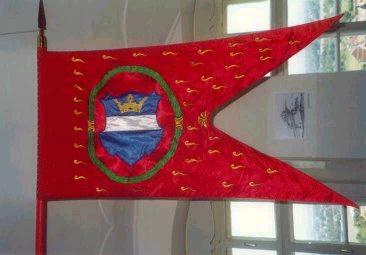 Flag of the insurrectionists of Zala County, 1660, Hungary. The photo was taken by me at the Castle of Lendava/Lendva, Slovenis. Hévíz town: <www.balaton.net/heviz.htm> and <www.evip.hu/Heviz/heviz1.htm>. Balatongyörök village: <www.balaton.net/bgyorok.htm> and <www.evip.hu/Gyorok/gyorok1.htm>. Gyenesdiás village: <www.balaton.net/gyenesdi.htm> and <www.evip.hu/Gyenes/gyenes1.htm>. Vonyarcvashegy village: <www.balaton.net/vvashegy.htm> and <www.evip.hu/Vonyarc/vonyarc1.htm>.